The Black Jaguar 200 Mark 3 is a 16 channel scanner from the early 90's. The scanner can be opened by removing the two screws at the bottom, rotating the bottom half carefully and shifting it backwards. It helps if you remove the two pushbuttons at the top of the scanner. The receiver IC is a DIL MC3361, with the baseband audio at pin 9. 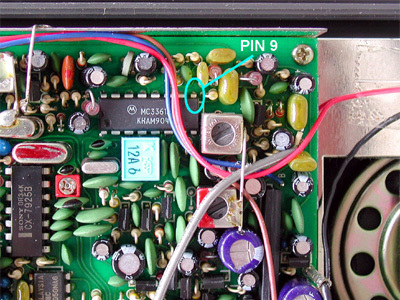 A 10 k is soldered to pin 9 and mounted vertically. The resistor's other lead is connected to a 2.2 nF capacitor. 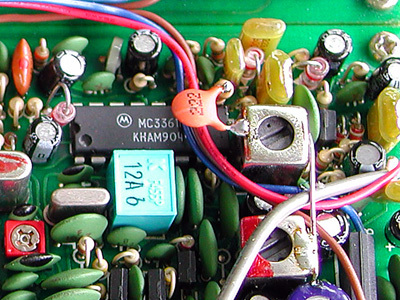 The capacitor's other lead is connected to the metal shield of the coil next to the IC. The inner connector of a piece of shielded cable is connected to the RC-joint. The braid is soldered to the PCB ground plane. 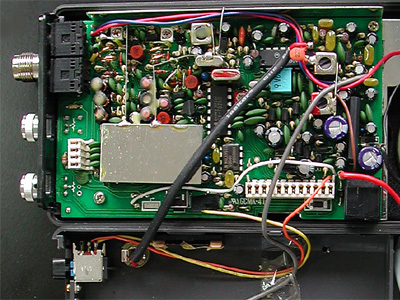 The other side of the shielded cable is connected to a 3.5 mm chassis terminal mounted in the back of the scanner. At the indicated position, there is just enough space for the jack.